"This culinary deviation from the traditional angel food cake version is a refreshing spring and summertime dessert." Toss strawberries with 1/2 cup confectioners' sugar in a bowl; set aside at room temperature for 1 hour for juice to form. Whisk flour, white sugar, baking powder, and sea salt in a bowl. Cut unsalted butter into flour mixture with a pastry cutter until mixture resembles coarse crumbs. Pour 1 cup cream into flour mixture, starting with 1/2 cup and adding a tablespoon or two at a time as needed. Stir to make a soft dough. Add more cream as needed. Place dough into a floured bowl and knead a few times with the heel of your hand. Roll dough out 1/2 inch thick on a floured surface; cut dough into 6 3-inch rounds using a biscuit cutter. Place onto ungreased baking sheet. Bake until tops are golden brown, 10 to 12 minutes. Cool on wire racks. Whip remaining 1 cup cream in a metal or glass bowl, using an electric mixer, until cream forms soft peaks when beaters are lifted directly up out of cream; gently fold in 2 tablespoons of confectioners' sugar and vanilla extract. Cover and refrigerate cream until ready to serve. To serve, split each shortcake round horizontally, using a serrated knife, and place bottoms of shortcakes onto serving plates. 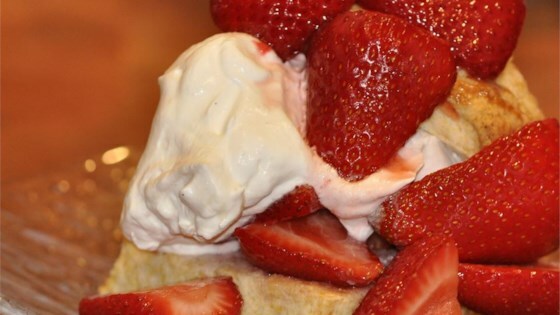 Spoon about 1/2 cup of strawberries and juice onto shortcake half; top with 1/4 cup of whipped cream. Place shortcake tops onto desserts; dust each dessert with about 1 teaspoon confectioners' sugar and a sprig of mint. Split glazed doughnut layered with sweet strawberries and freshly whipped cream. Ummm if you want a more cake like biscuit use a more cake like biscuit recipe do not take stars off because you wanted a different recipe . This is my first attempt at shortcake and so glad I picked this one. My husband thought it was great and I thought it was not only tasty but so easy to make! Made as directed. Soooo delicious. "Biscuit" shortcake is outstanding!